When visiting International Antarctic Centre in New Zealand, I came across the Hagglund. 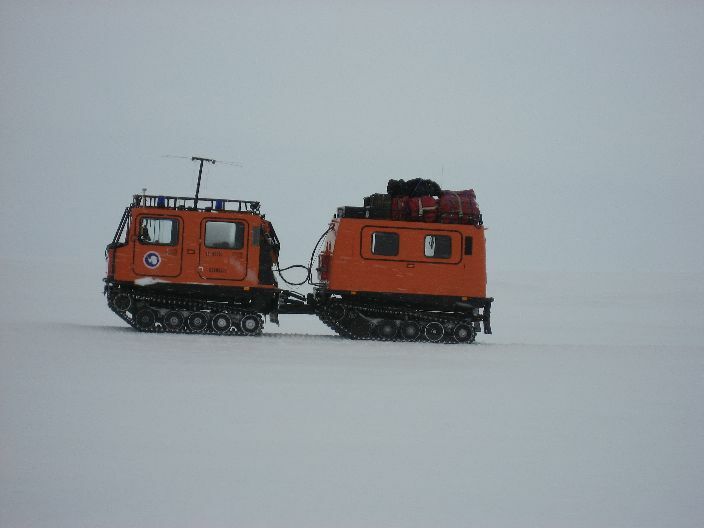 It was the designated land vehicle for exploration of the ice-covered continent. I was impressed by the joy ride that they offered at the centre and did a little more research upon returning. Hagglunds are all terrain vehicles (ATV) that are used for special navigation purposes. They are often utilized in unusual or hazardous terrains. Their uses are widespread, ranging from military load carriers, emergency medical services, firefighting, territorial exploration, wilderness search and rescue. 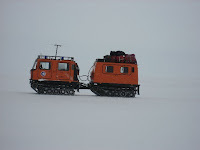 It can also operate in extreme weather conditions like those in Antarctica. Hagglunds consist of two track-driven cars with fibreglass reinforced bodies, coupled to each other by an articulated steering joint. It can traverse across a wide range of terrains including paved roads, muddy swamps, snow- or ice-covered fields, mountainous slopes, and bodies of water (semi-submersed). The front car houses the engine, transmission gearboxes, in addition to the steering and braking systems. It also carries the driver and up to 3 passengers. The rear car serves a variety of purposes, usually in the carrying capacity. This usually includes additional passengers, firefighting equipment, emergency life support equipment, and more.